Add some sparkle to your table tops, with a sprinkling of table confetti to co ordinate with your colour scheme or theme. Confetti is available in literally hundreds of different shapes and colours to suit any occasion from a Wedding or Anniversary party, to a Casino Evening or Corporate Event. Please let us know your colour scheme and/or theme, and we'll do our best to get a confetti to match. These small acrylic crystals are available in a huge variety of colours to suit your event/wedding colour scheme. 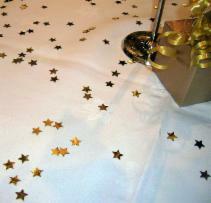 They look great scattered over table tops to reflect the light. These paper petals give a soft effect when scattered over table tops. They can also be used to great effect when sprinkled down each side of the aisle at your wedding ceremony.